This came in the day after recording our latest Recent Arrivals podcast, so I thought it deserved mention. 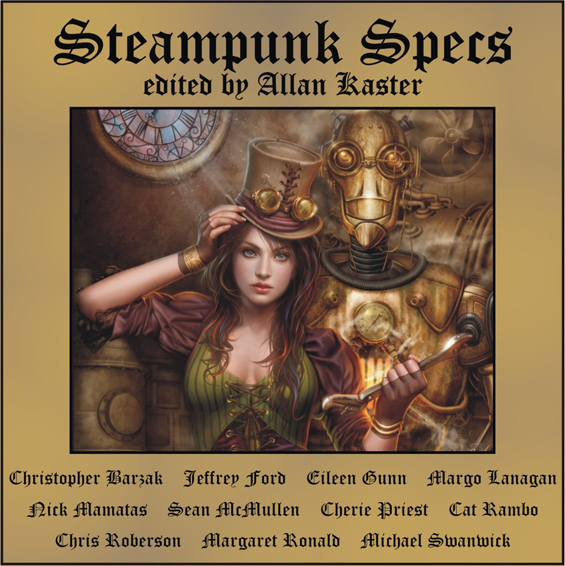 Steampunk Specs releases February 28, 2013 from Infinivox. A woman comes to terms with the loss of her family to the child labor mills of the city. A doctor tries to cope with a strange plague terrorizing the citizens of London. A sexually repressed wife gets revenge on her husband through a robot maid. Friedrich Engels strives to spread class revolution as a labor organizer for factory cyborg matchstick girls. An acclaimed mathematician, with a murky past, is forced to spy for an industrial prior to becoming Britain’s foremost rocket expert during World War II. An orphan boy builds an automaton, in an aging scientist’s laboratory, that becomes more than an idle companion. An English aristocrat courts a woman who would rather spend her time in a laboratory than at a high society ball. At Chicago’s Columbian Exposition in 1893, an Algerian bodyguard crosses paths with a disoriented naked man. A dirigible journeys to an isolated land and discovers people and animals merged with machine parts. Radio Jones finds a way to listen in on the Naked Brains, who rule the world, while Rudy the Red fights against the oppressors. Unabridged readings by Tom Dheere, Vanessa Hart, and Nancy Linari, for a total of 8.5 hours. Steampod releases its first XMas story on December 20th!